We The People, a new documentary for BBC Two Northern Ireland, explores the impact that Ulster-Scots emigrants had on different aspects of American culture, life and politics, including their role in the framing of the US Constitution. We The People is a DoubleBand Films production for BBC Northern Ireland, supported by Northern Ireland Screen’s Ulster Scots Broadcast Fund. During the Presidential elections of 2016 outgoing President, Barack Obama surprised many when, in a speech in support of Democratic candidate Hillary Clinton, he referred to his Scotch Irish grandparents. The speech was President Obama’s way of making a direct appeal to former Democrats who were considering voting for Donald Trump – particularly the people of the ‘rust belt’ and Appalachian Mountains, many of whom can trace their roots to the north east of Ireland. Relatively few people in the US describe themselves as Scotch Irish, but the documentary highlights how their cultural footprint and legacy is still evident in many aspect of American life today. We The People focuses on the experiences of the mainly Presbyterian, Ulster-Scots farming families who began to arrive in Boston from the 1700s onwards. 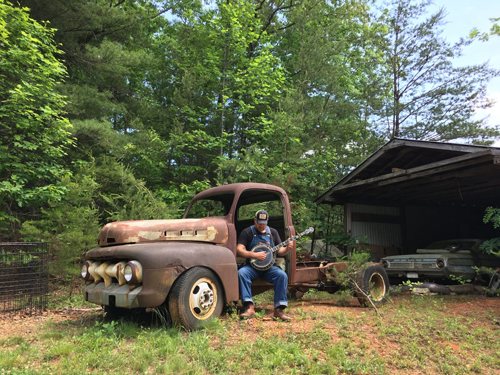 It travels to a whiskey distillers in Virginia, a log cabin building in Rockbridge County, a musical jamboree at Floyd country store and the McGlohon Theatre in Charlotte, North Carolina to hear a reading by playwright Robert Inman. The programme looks at the impact President Andrew Jackson – whose parents were from Carrickfergus. He had a difficult relationship with the Washington establishment and had a populist style of politics – something that may explain part of his appeal to President Donald Trump. We The People will broadcast on BBC Two Northern Ireland on Sunday 16 September at 10pm.